Users are provided with comprehensive control of applications running on a home PC. Enhanced “sandbox’ Virtual Kiosk lets you run many popular programs and open web sites in a safe isolated environment where they can not affect the system performance. A proposed locking mechanisms help reduce the risk of infection of your computer by giving other users access only to safe applications. Special mention deserves the function ‘Game Mode’. In the ‘gaming’ mode operation of games and other applications that are deployed on the screen, is not interrupted messaging antivirus. A virtual keyboard ensures effective protection against application-keyloggers that can intercept passwords and other sensitive information entered by the user. Pay attention to the fact that the product Internet Security Premium is now available for free. If you feel the need for additional protection, the application can be easily upgraded to Pro, Complete and Plus. – Support for ‘hot’ keys. New Tool Autorun Analyzer is responsible for reviewing the contents of the Startup menu, and notes the potentially dangerous and suspicious objects. After learning of the information provided, the user can click on a button to temporarily disable the specified service or application or delete the list. 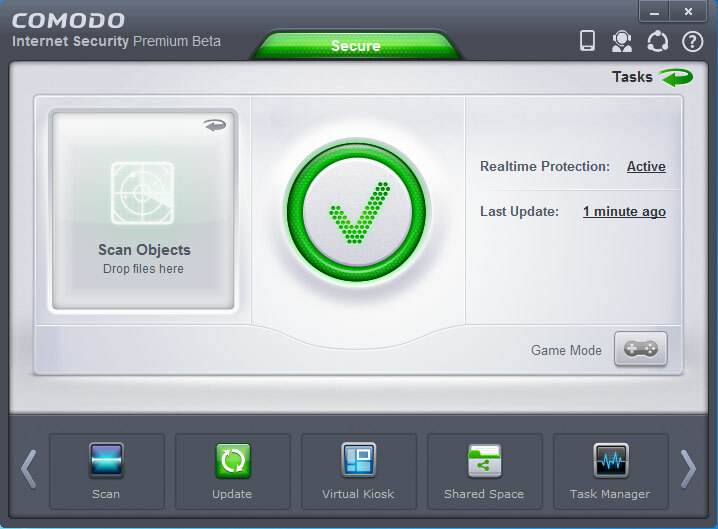 The package includes an annex COMODO Cleaning Essentials (CCE) – a set of utilities to test the system that does not require installation on your hard drive and run directly from a portable media (USB flash drive, CD or DVD).